If you need something super easy for your gluten free Thanksgiving dinner, but don't want to add too many extra pounds, these delicious bars are the way to go. These simple bars will put a smile on your face! No need for a complicated recipe or expensive ingredients. 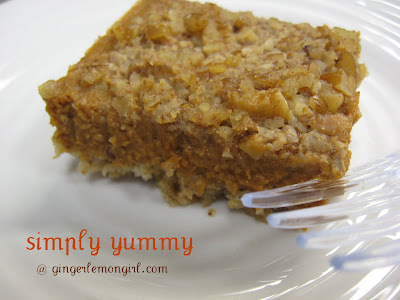 Just plain easy, delicious, and gluten free! I promise these bars will even please your gluten-eating family members!! The bars have a "cookie/granola" like crust made from a few simple ingredients, then a basic pumpkin pie filling, and topped with pecans and sugar. This would be delicious with a scoop of ice-cream or whipped cream! The best part is you don't have to worry about a time-consuming gluten free pie crust!! This dessert is low in fat, low in sugar, no added salt, and gluten free! **Also, to make this casein free, simply use coconut oil instead of butter, and use coconut milk in place of the regular milk called for! Easy peasy!! For Crust: Combine all crust ingredients until mixture is crumbly. (This took several minutes using a fork to combine until crumbly.) Press mixture into a greased 13x9" baking pan. For Filling: Combine all filling ingredients into a large bowl and whisk together until thoroughly combined. Pour pumpkin pie filling over crust. For Topping: Combine chopped pecans and sugar in a small bowl. Sprinkle pecan topping over pumpkin pie filling. Heat oven to 350 degrees. Bake for 40-50 minutes or until a knife inserted in the center of the bars comes out clean. Let cool completely before cutting. 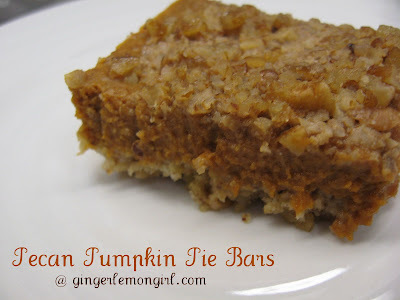 Makes 16 pecan pumpkin pie bars! Top with whipped cream or ice cream and enjoy!! ** If you do not have any of my Gluten Free Master Baking Mix for the crust handy, simply use 1/4 cup brown rice flour, 1/4 cup tapioca starch, and 1/4 teaspoon baking soda. oh carrie those look so amazingly delicious and are making me really hungry. they might show up at thanksgiving, or heck, they really might show up at breakfast! Many of your recipes have such interesting, healthful ingredients - especially this one! I whipped up your pumpkin custard pie last night, as a trial run for Thanksgiving. It's decadent and creamy, not too pumpkin-y. The magic crust worked great! I used my yellow pumpkin-like squash, and replaced 1/4 c sugar with brown sugar. I might try it with some of my persimmon pulp next. That would give it a fruity flavor. They sound so yummy, Thanks for sharing! Carrie, that looks fabulous. I will have to try it over the weekend! I made these yesterday, and they were great, although from your pictures and the name I was expecting more of a granola-bar type texture. My bf called them "pumpkin tart" which I thought was a good description. Never much a fan of boring old pumpkin pie, I really like these. Marisa -- SO glad you liked these!! Sorry if the description seemed off! It is definitely like a pumpkin tart! I love the texture of the crust though!! Really glad you enjoyed them! Thanks for letting me know! Melanie-- Thanks gal! i hope you have a WONDERFUL Thanksgiving!! These look amazing! I was concentrating too much on vegan blogs that I overlooked the awesome gluten-free blogs. Love it!